Inductive surface hardening is an attempt to harden only the surface of a structure without affecting the inner portions of the part so that internal tensile stresses are avoided. This is particularly important when it applies to gears. The tooth and root portions of the part must be surface-hardened in order to provide resistance to wear and abrasion, but the tooth must not be through-hardened in order to avoid brittleness and early fatigue. 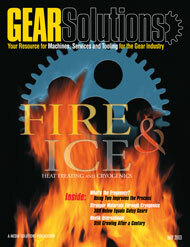 Internal gears for automatic transmissions must be heat treated because of the stressful demands of its function. 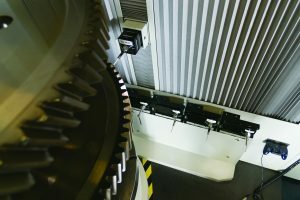 In addition to traditional carburization, there are several inductive methods which can be applied to protect these gears from wear, but all have their limitations. For example, if we were only interested in reducing the resistance to wear by pitting in the flange of the tooth, then induction hardening could be performed with high frequency power of 150 kW, and with a heating time of approximately five seconds. The problem with this technique, however, is that the root area is not hardened. This is particularly problematic in today’s industry, where higher engine outputs result in more stress being applied to the root areas of the gears. Unfortunately, this problem cannot be resolved by simply applying more high-frequency power, or by the application of additional time, because the end result is through-hardening of the tooth. 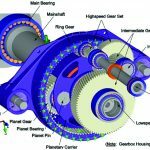 As a result of this limitation, in Europe, most internal gears are carburized. Roughly 15 percent of the cars produced there are sold with automatic transmissions, and so the need to find a solution to this problem is not as pressing. In the United States, however, almost 95 percent of all the vehicles produced are sold with automatic transmissions, so there has been a strong demand to find an efficient alternative to carburization and the through-hardening of the tooth whenever high frequency is used with the inductive process. The desire to solve this through-hardening problem has led to the creation of various inductive heating methods, which have been patented between 1985 and 1995, and all of which share the common goal of obtaining residual compressive stress by hardening the tip, flange, and root of the tooth without the through-hardening of the tooth structure itself. Dual Frequency Method–It has long been known that, with medium frequency, one could harden the root area of the tooth. However, this also resulted in through-hardening of the tooth when attempting to achieve the desired depth of root hardening. It was then discovered that, if one applied medium frequency in advance to the part in a preheating scenario, this would compliment the effects of the high frequency later applied. Parts would be heated to approximately 700 degrees Celsius, and then, for final austenitization, a high frequency would be applied for approximately 0.4 seconds with immediate quenching. This process is somewhat cumbersome, since it requires two separate induction coils, very fast mechanical transporting of the pre-heated part, and two generators. These problems may be overcome through the use of a high-load mechanical crossover switch to connect the single coil first to the medium-frequency output circuit and then to the high-frequency output circuit. However, this solution still highly reliant upon the performance of the mechanical switch which easily wears out due to the high-current loads. Single Frequency Pre-Heat Method–In an attempt to avoid the apparent duplication of equipment and the coils needed to perform the “dual frequency method,” and to simplify the process, a “single frequency pre-heat method” was developed. In this technique, the tooth and root areas are pre-heated with a low high-frequency power density to around 700 degrees Celsius, and then the part is austenitized with a burst of high-frequency power for approximately 0.4 seconds with immediate quenching. Modified Single Frequency Pre-Heat Pulse Method–A recent variation to the single frequency pre-heat method has involved the deployment of pulsing. Equipment with a higher output capacity is used, insuring better root-hardening characteristics. Pre-heating is accomplished by the use of a number of short high-frequency power pulses, with pause durations calculated to allow the heat energy to be absorbed into the part. Applicable to all these pre-heating techniques is the limitation of root hardening depth of approximately 0.3 mm. The total heating time for these methods is around 10 to 12 seconds, and the power used ranges between 200 and 400 kW. 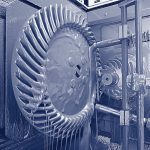 Furthermore, all of these pre-heating methods use expensive, completely machined induction coils, which are single-turn coils with integrated quench and flux concentrators. Over the years of using inductive heating and hardening, we have learned a great deal about the various characteristics of medium and high frequencies. Specifically we know that, in order to accomplish hardening depths of 1 mm or less, that high frequency (200 to 900 kHz) should be used. And when hardening depths of 2 mm or greater are required, that medium frequency (10 to 25 kHz) must be used. These guidelines are excellent when one is working with uniform parts. However, the industry’s desired application is to follow the contour of the part, as is the case with gears and sprockets. Inductive hardening is very efficient, quick, reliable, and cost effective, but the induced current flow does not naturally want to follow the contours of the part. To date, the highest quality of gear-hardened parts has come through carburization. That is why European manufacturers have avoided the use of induction hardening. It is their opinion that the cost savings are not sufficient to justify the sacrifice in quality. 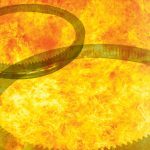 The gear industry in the United States has long been wrestling with how to replace carburizing, because it knows that if the gears can be hardened with induction, then significant cost savings can be realized. 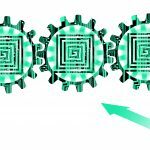 With the large volume of gears used in the automotive industry, cost savings is a serious concern. This industry lives and dies on the saving of mere cents, so engineers want to solve this puzzle of how to force the induced current to flow within the contours of the part so that true-contour hardening is achieved. As outlined above, engineers have combined medium and high frequency, they have increased power, reduced power, and they have increased and decreased the coupling distance. They have pre-heated and pulsed the parts in order to force the induced current to do what they desire and need. 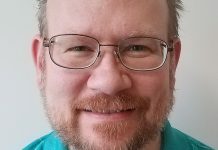 The end result is that all of these systems have had their limitations; some so basic as not performing as required, and others being able to do so, but not on a consistent basis. All of these methods have been a temporary patch on a problem until the right solution could be found. The only way to conquer the challenges introduced by geometrically complex and contoured surfaces is to harness the benefits of both medium and high frequency, and to force them to work in concert. One needs high frequency to harden the tip and flange of the tooth, and medium frequency to harden the root. In the end, this is a question of high-energy concentration, at the correct position on the part, using the best frequency mixture. As it is with most things in life, we know what we need, but the trick is to figure out how to make it happen. With respect to hardening gears, we know that the use of high frequency will harden the tip and flange of the gears very well. We also know that medium frequency is perfect for hardening the root of the tooth. 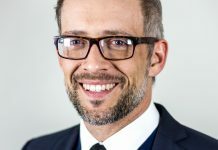 Unfortunately, if we use both methods–either individually or together–it will result in through-hardening of the tooth, with the unacceptable result of brittleness. The “trick” is how to get these two frequencies to work together without resulting in through-hardening. In short, we know that we must use both medium and high frequency simultaneously. This puzzle has finally been solved, through the creation of the Simultaneous Dual Frequency Method. With this approach, medium and high frequencies are simultaneously supplied to one inductor. 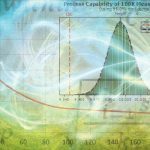 It is a frequency blend where the medium frequency is used to provide the ground wave upon which the high frequency is superimposed. superimposed HF ocillation on the MF ground wave. What is so unique about this process is that the amplitudes of both frequencies can be controlled independently: one inductor can be used, and one generator can produce both frequencies simultaneously. The ability to control the amplitudes of either medium or high frequency allows one to specifically tailor the energy density delivered to the part, thereby allowing one to better control the current flow to “follow” the contours of the part. To insure true-contour hardening of the tooth without through-hardening and effecting the core of the part, short heating times of less than 0.5 seconds are required. To accomplish the same result with the other inductive methods, 10 to 12 seconds of heating time is normally required. Now we are dealing with heating times significantly less than a second! 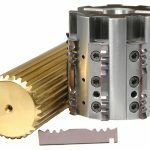 When an internal gear must be hardened in a mere fraction of a second, very high power is required. For example, for a gear with an inner diameter of approximately 120 mm, power of about 400 kW medium frequency and 200 kW high frequency is needed. The additional benefit is that the risk of distortion is practically eliminated, so not only is there a monumental increase in the number of parts which can be produced, but we have also solved the distortion problems faced during carburization. With the Simultaneous Dual Frequency (SDF) method, one common induction coil is simultaneously supplied with medium frequency (MF) and high frequency (HF) power. The power ratio between these two frequencies is two to one (MF to HF), so as to compensate for the greater metal mass located in the root of the tooth, which dissipates the heat necessary to properly harden this portion of the gear. The typical heating time is approximately 0.5 seconds or less, in order to avoid through-hardening of the tooth. The hardening depth which can be controlled in the root of the tooth is more than 0.5 mm with the SDF method. The usual power needs are 600 kW, being normally divided as 400 kW medium frequency and 200 kW high frequency. 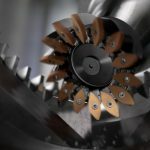 As noted earlier, carburization has been the most reliable way of hardening gears, but it requires a lot of time and uses a lot of energy, as well as space. Induction has presented an alternative, which provides immense cost savings and permits substantially higher production runs. 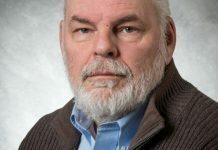 However, the methods heretofore have been cumbersome, costly in their own ways, and produced a product that can be subject to consistency restraints. 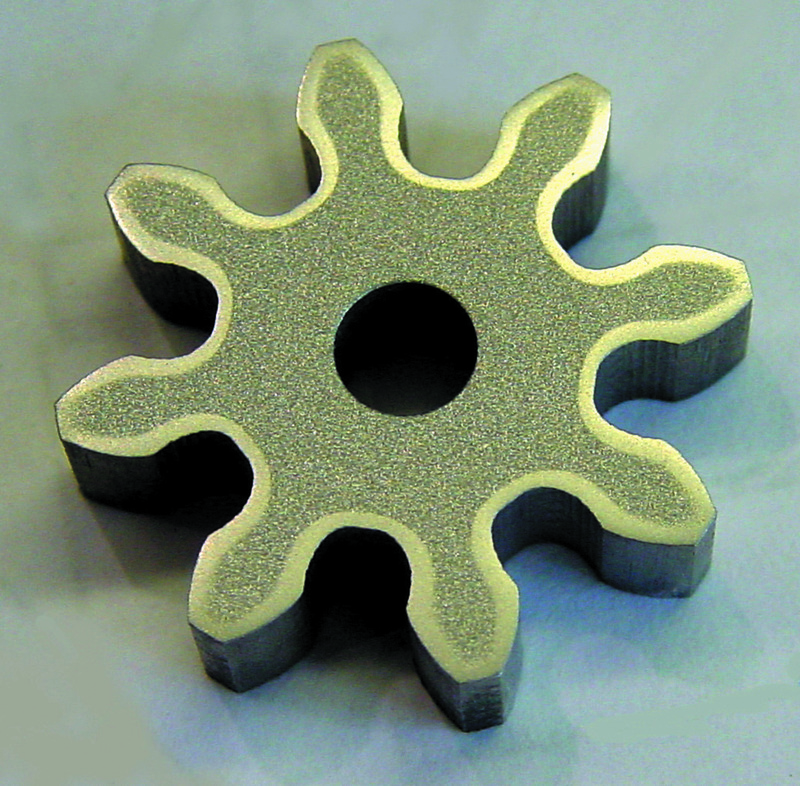 Powder Metal Sprocket heated with Simultaneous Dual Frequency [SDF]. 160 kW MF-Power (12 kHz) and 80 kW HF-Power (250 kHz) for 0.2 seconds. Note perfect contouring with the part with no through hardening of the teeth. Uniform hardness depth of 1.0 mm to 1.2 mm at HRa 74 mass quenched. 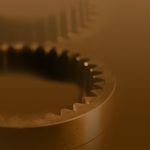 Sprocket is 100 mm in diameter with 32 teeth. Tooth thickness is 5.2 mm. 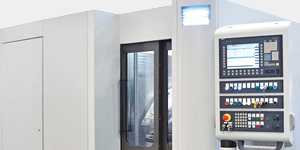 With induction, the quality of the part can be precisely controlled and monitored. Equipment can be computer monitored so that, if an inconsistency exists, the part can be immediately rejected. Unlike carburization, we potentially have total control of the quality of the part, because engineers know the tolerances of the materials used, the power is known, and how long it has been applied. 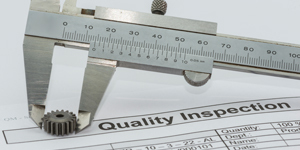 Virtually all the variables are kept under control, so consistent high-quality parts are possible. Additionally, manufacturers no longer need to be overly concerned with part distortion from either carburization or longer induction heating times from the previous heretofore used induction methods. 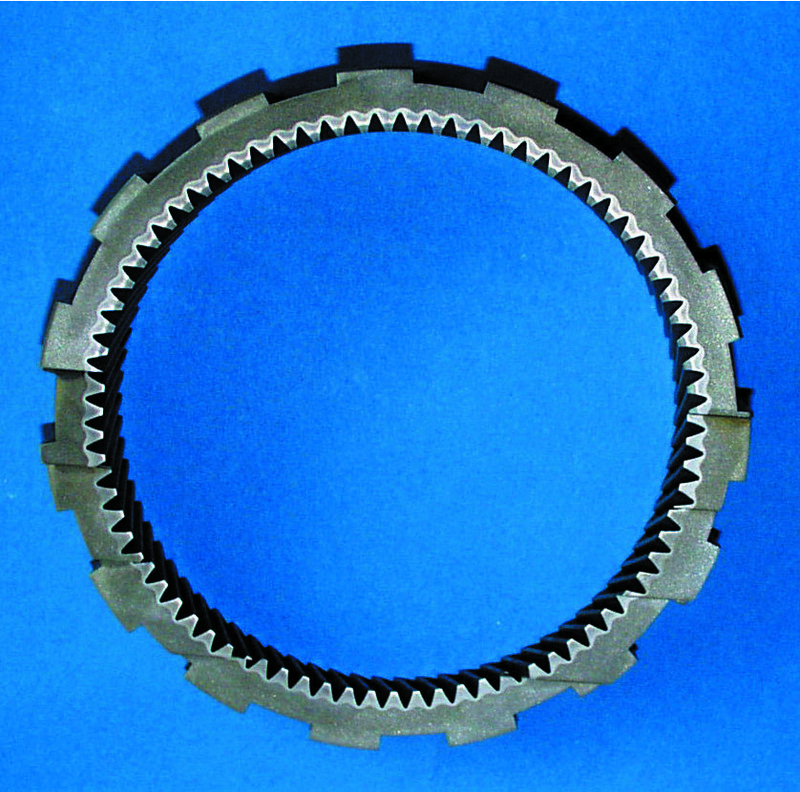 When a gear is exposed to heat for mere fractions of a second, the penetration of heat into the core of the part is eliminated. 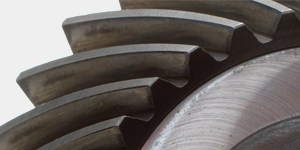 As a result, there is less residual stress released in the part, resulting in less distortion, while at the same timeproviding higher residual compressive stresses in the surface of the gear. 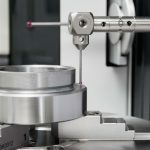 Another advantage discovered while developing this new method has been that expensive, completely machined single-turn coils with integrated quench are not necessary, or preferable. More cost effective two-turning coils are normally used, with 30 percent more efficiency than single-turn coils. These coils have the added advantage of lasting longer, because they are constantly and directly cooled. Quenching is accomplished through a separate adapted quench head that is fitted to the coil. At right are various parts hardened using the SDF Method. Note how the hardened zone perfectly conforms to the contours of the part; and keep in mind that all of this is done in fractions of seconds. With this new process, a new era in induction hardening has been introduced. 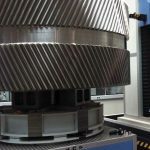 We are only at the beginning of exploring its capabilities, but, depending on the size of the gears, output rates of 1,800 parts per hour are now possible. 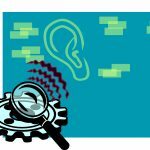 Initial testing of the Simultaneous Dual Frequency Method has been extremely encouraging, and the areas of application are continually expanding. 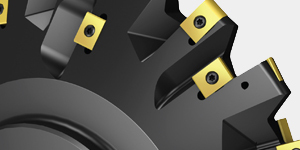 For the first time, true-contour hardening of geometrically complex components has been achieved. With these developments, we have paved the way for future savings on a variety of components. We have now moved induction surface hardening into the next generation by utilizing the optimal frequency mix of medium and high frequency, combined with high-power outputs and short processing times, to achieve extremely high production rates with negligible distortion. Without the development of the Simultaneous Dual Frequency Method, true-contour hardening would not be possible. 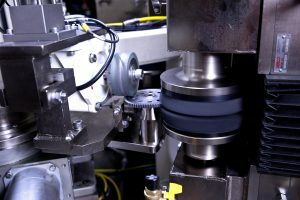 It is now possible to think in terms of the start-to-finish production of gears, with the in-line incorporation of a hardening method. 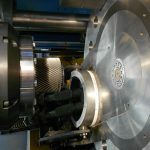 When higher carbon-based parts are utilized, this induction hardening method will produce parts that will rival those produced through traditional carburization, in terms of uniformity and the consistency of depth and hardness. Furthermore, all this is done in a manner that allows manufacturers the ability to conform with “just in time” manufacturing demands. Additionally, the smaller equipment requirements will allow for space savings, as well as permit greater flexibility in how the plant or individual work cells are laid out. Finally, since heating times are kept so short, it is sometimes possible to rely on the mass of the part to quench itself. In addition, while the part is still in place, it is now possible to temper the piece using the same equipment, because the medium frequency can be separately programmed for application to the part. This alone provides substantial cost savings in terms of material handling equipment, not to mention time lost in transferring the part from one station to another. We are only beginning to learn what this new technology is capable of achieving. 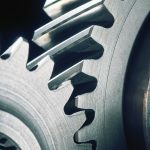 While it is ideally suited to the gear industry, it can also be applied to powder metal parts, stampings, castings (grey iron and nodular), and forging. Additionally, it works well with numerous grades of steel–from carbon to alloy. At this time, only our imagination limits the exploration of ways to apply this new technology to existing manufacturing processes. 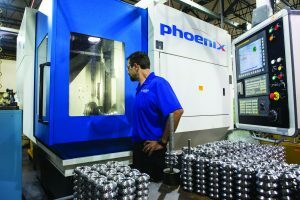 This method will allow customers to produce improved quality parts, on a more consistent basis, at higher rates of production, and all at substantially lower costs. 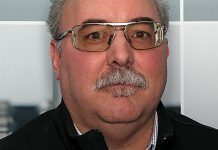 is president of Eldec Induction U.S.A., Inc., which is located in Auburn Hills, Michigan. He can be reached at (248) 364-4750 or by sending e-mail to schwenk@eldec-usa.com. For more information on the company, visit their Web site at [www.eldec.de].